Rick McKee is the staff cartoonist at The Augusta Chronicle. In 2006, McKee was named Time Magazine’s Person of the Year. Along with everybody else. John Smith is a free-lance writer from New York City. He has also had an article published in the Bronx Borough Advertiser. However, when I think about my various “titles,” it’s not the ostentatious ones I’m most proud of . . . it’s the intimate honorifics. 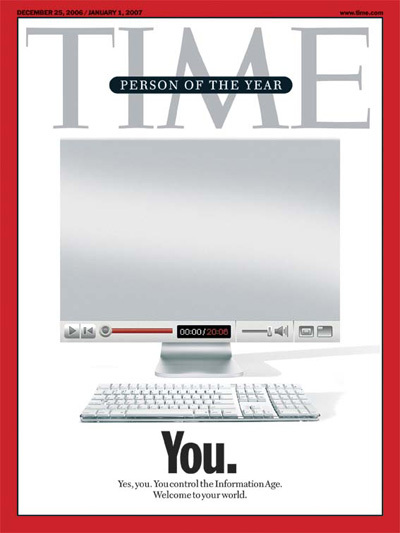 Returning to 2006, when you were honored as Time’s person of the year, I thought you might enjoy seeing the cover of the issue which proclaimed the fact. After reading the “small print,” I suppose if you don’t have a computer, and haven’t joined the “Information Age,” you may not be included in the award. But then, if you weren’t “connected,” you wouldn’t be reading these words now . . . so, please feel free to begin adding that great accolade to your résumé! Robert Stroud is a journeyman blogger who lives in a remote forest and was named Time Magazine’s Person of the Year in 2006. He is presently awaiting the blanket award of the Nobel Prize for Literature to the myriads of dedicated bloggers who have transformed the Information Age. Thank you for this. I am SOOO going to use that biographical note. Love it. I read all your posts. Thank you Friend. Thank you, Dell, Friend and Brother. Your reflection on titles is so very close to home for me. Haven’t looked back once since choosing to retire as a Ch, Lt Col! Pastor, friend, Dad are my favorite titles along with sweetheart to my beautiful and faith-filled fiancée whom God brought to me and worked through to bring me out of a period of personal darkness. Along with that best and happiest title of all, “friend”, many of us wish to award you with the Superguy Cloak that goes with it. You stumbled onto Mere Inkling right when I began blogging, and it’s wonderful how our friendship has grown just through reading one another’s words. Thanks for the cloak… unfortunately I mislaid it and still trying to find it! It knows where you are – that’s all that matters. Fun! I enjoyed the focus on “friend” and the Lewis quote, and your stellar biographical footnote! Just to let you know: I put a temp link to this post on my front page. I couldn’t agree more with you and CSL about friendship. It’s the point. God had friends before us (the most famous and longest continuously running small group ever – very small – only Three) and wanted to invite us in (that sounds way too much like I’m saying we get to be part of the Trinity, and I’m definitely not proposing that! But I assume you know what I mean.) And I think that’s the mission we’re on, the one called the “Friendship Quest,” where we’re making friends with God – that is, becoming better friends with God and going out with him to make other friends (for him and for us). I understand, and agree with you. Friendship that’s even deeper, right . . . since we are actually inviting the guests at the Marriage Banquet to become part of the family itself!